Novel dosage forms like microspheres and nanoparticles present a challenge when developing a standard method for in-vitro release. Currently, there are no compendial methods for these dosage forms and information on such drug release methodology is limited. The primary complication of developing a suitable method rests with clarification of the sample due to the difficulty or impossibility of filtering micro- and nano-particles. This inability to filter allows the dissolution process to continue. For this reason, some of these dosage forms are currently being evaluated using dialysis materials of an appropriate molecular weight cut-off (MWCO) to retain undissolved material. For example, a microsphere suspension may be placed in the dialysis bag, which is then sealed and inserted into an appropriate dissolution media. In this type of set up, the product diffuses through the dialysis membrane to the receptor medium where concentration accumulates and samples may be withdrawn. In this scenario, it is also important to ensure the drug product does not bind to the membrane itself. 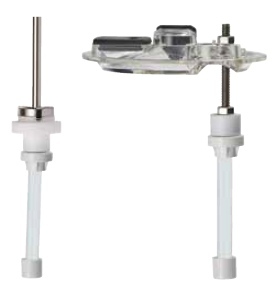 Agilent has developed several accessories to accommodate the Float-A-Lyzer™ ready-to-use dialysis device from Spectrum, Inc. (www.spectrumlabs.com). These devices are available in volume sizes of 1, 5, or 10 mL and each have a weighted end with a top that opens and re-seals. The cellulose ester membrane is available in 9 MWCO’s ranging from 0.1-0.5 kD up to 1000 kD. Agilent’s adapters allow for easy conversion of a traditional USP Apparatus 1, 2, or 3 instrument for use with the Float-A-Lyzer™. The Apparatus 1 holder uses rotational mixing, while the Apparatus 2 system implements a suspended holder type setup, similar to a stationary basket. As is customary with Apparatus 3, the holder is subject to reciprocating action. Ordering information for each of the specific the Agilent holders may be found in the following table. The Float-A-Lyzer™ dialysis devices may be acquired directly from Spectrum, Inc.
For more information about these devices or with questions about your specific application, please contact the Agilent Dissolution team at dissolution.hotline@agilent.com.